The breakdown of media types shows that Twitter and online news are the most relevant channels in the conversation about Ebola. The Ebola epidemic was and continues to be heavily discussed across all platforms, from Twitter to online news. Ebola was mentioned more than six million times in November 2014 alone. In order to find the most relevant and important results, (in this case those related to the development of an Ebola vaccine), pharmaceutical companies need to cut through the noise. To limit the number of search results and find the most relevant results for a given topic, Communications, Research & Development or Market Research departments within a company should be able to filter the overall results according to their specific needs. Currently there is no drug or medication explicitly designed to treat Ebola. Treatment today relies on treating the symptoms patients show (e.g. making sure they do not dehydrate) but the patients have to fight the disease as such by themselves. The mortality rate for the 2014 outbreak in Africa is around 70%. It is therefore no surprise that a lot of the conversation during the epidemic focused on the research and development of a more effective treatment or even an Ebola vaccine to prevent the disease from spreading in the first place. 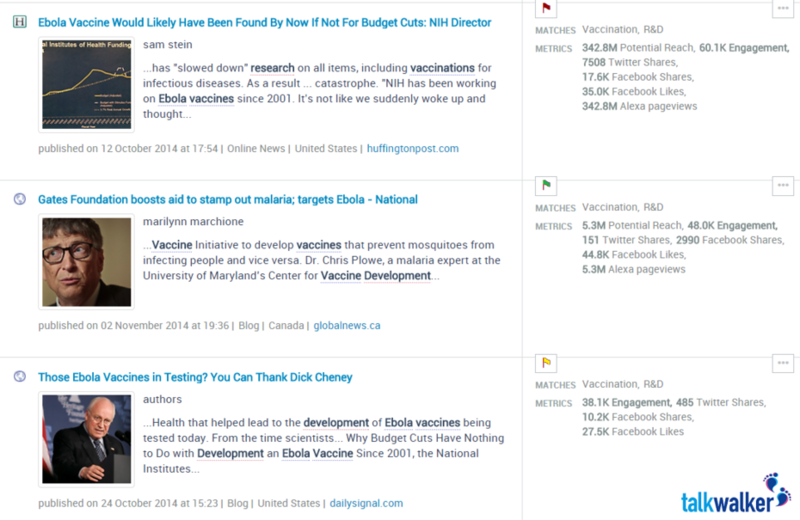 Selection of search results found by Talkwalker for the topic of research and development of an Ebola vaccine. A look at these results can offer pharmaceutical companies and health institutions insight into the overall tone of the conversation. Being aware of the most discussed topics in the public discourse and the overall tone of the discussion allows them to see how they are perceived by the public and focus their communication strategy on the most relevant topics or on those that have the potential to turn into crises. One such topic – as seen above – are budget cuts for research institutions, another one can be seen in recent allegations that the development of an Ebola vaccine was delayed because the disease mainly affected poorer countries. While research and development of new medications are generally costly, the allegation here includes the insinuation that pharma companies were willing to risk the lives of people who simply could not afford their products – a serious threat to the reputation of any company. Pharmaceutical companies are no strangers to heated discussion on the Internet. While some of the claims circulating about epidemics and “Big Pharma” seem unlikely from the very beginning – for example the claim that smoking marijuana offers protection from Ebola – others can cause serious harm to pharmaceutical companies or their reputation. 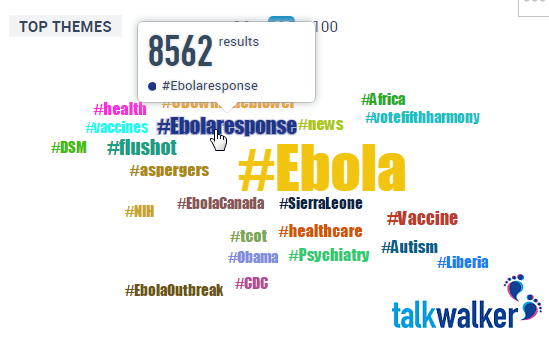 A look at a theme cloud, based on the search results Talkwalker found for Ebola and various related terms. Many of hashtags mentioned in this context refer to politics or the African countries especially affected by the Ebola outbreak this year. However, there are several other hashtags referring to vaccines and the alleged harm they cause – for example the claim that vaccines cause autism or that the injections contain heavy metals and are actually poisonous. One of the most damaging theories is that Ebola was created by the pharmaceutical industry to make more profit – or even as a form of population control. While all of these allegations are very far-fetched, pharmaceutical companies should nevertheless be aware of them. Despite an initially low number of followers, these statements can gain traction quickly if a major player or influencer decides to pick them up by discussing or sharing them with their own followers. The speed that such statements can become widely accepted as “facts” or as “credible theories” is related to the skepticism of established vaccines, which will be discussed in more detail later on. While these statements do not always necessarily require a response, pharmaceutical companies should be aware of every aspect of the conversation about them in order to avoid unpleasant surprises. Like any other industry, the pharmaceutical industry, too, has more than just one player trying to come up with a vaccine or an Ebola treatment ahead of the rest. By listening in to the conversation about their competitors, pharmaceutical companies can keep up-to-date on the latest developments in their sector. It also allows them to benchmark their own performance and achievements against that of other players. The top results for some of the largest pharmaceutical companies worldwide, filtered for results connected to Ebola. While the results of the latest research are often published in mainstream media, a more detailed explanation and discussion is often limited to specialist publications. 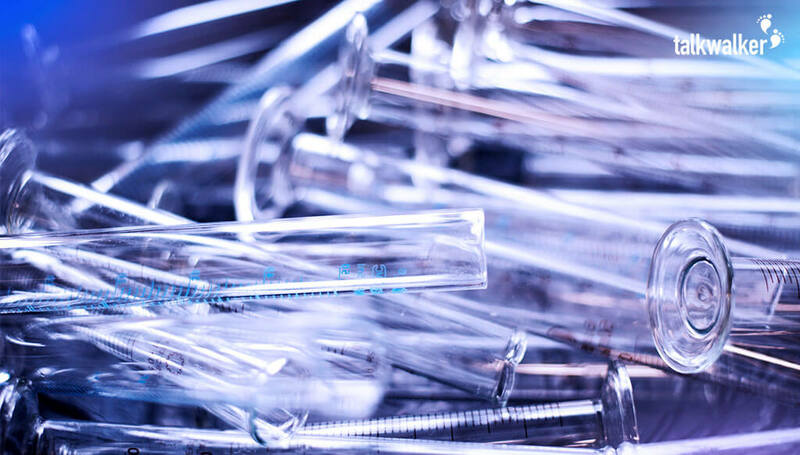 Pharmaceutical companies can use social listening tools like Talkwalker to keep an eye on those publications in addition to other media for a full picture of the current status of research and development in their industry. The list of results pictured above is sorted by engagement, meaning the number of people who have commented, liked or otherwise interacted with the posting. Alternatively, it could be sorted by potential reach. In doing so, drug manufacturers can get an idea of how many people could potentially see what is being said about the companies – or what they say about themselves. Monitoring the performance of their owned media channels gives pharmaceutical companies the chance to benchmark their performance against competitors. They can then see which types of content their audience appreciates the most or which kind draws none or even negative reactions. It also allows them to see the context in which their company is receiving a lot of mentions, providing a clearer idea of which topics are most important to their audience. IS THE MOST DISCUSSED DISEASE ALSO THE MOST DANGEROUS? While Ebola is no doubt a terrible disease, the discussion about it is related to outbreaks – meaning most of the conversation happens during these times and rarely outside this context. Since it is also a disease that most Western nations have very limited contact with, it is not something that is discussed on a daily basis. In contrast, there are diseases that are much more common in Europe or North America, but receive much less attention overall. Examples are common childhood infections like measles, whooping cough or chickenpox. The comparison for Ebola and other infections that are more common in Western nations, filtered for vaccine-related mentions, shows that a vaccine for Ebola receives significantly more buzz. The mortality rate for the current Ebola outbreak hovers around 70% - no doubt a devastating number. However, in absolute numbers, there are significantly fewer cases of Ebola infections than measles. Within the United States, for example, about half a dozen people tested positive for Ebola in 2014, while there were more than 600 confirmed cases of measles infections between January and October of 2014. For whooping cough, also known as pertussis, the US reported more than 17,000 cases between January and August 2014. At the same time, the conversation for an Ebola vaccine shows more than 91,000 results for the past 30 days, while the number for whooping cough remains just shy of 15,000. The conversation around both topics covered a number of issues. But one of the most prominent was the question of why people demand a vaccine for Ebola, when they refuse to have their children vaccinated against other diseases like measles or whooping cough. These diseases are not only much more common in the United States than Ebola, they are also easily preventable through vaccination – yet many people refuse to make use of the readily available immunization for a number of reasons. For pharmaceutical companies, insights into how much a topic is discussed can help prepare a communication strategy for this area. The information could also be used to draft awareness or information campaigns about the benefits of vaccinating against easily preventable illnesses. Listening to the conversation on social media during an epidemic allows pharmaceutical companies to see which diseases are the most discussed in a certain context while also offering an opportunity to see where the conversation is happening, in the sense of geographic location as well as the most-used platform for discussion. Knowing these details provides companies with the opportunity to tailor their response to a particular audience. If they want to drill further down into their social media performance, sentiment analysis could provide even more insights into the nature of the conversation and the attitude towards different companies and products. 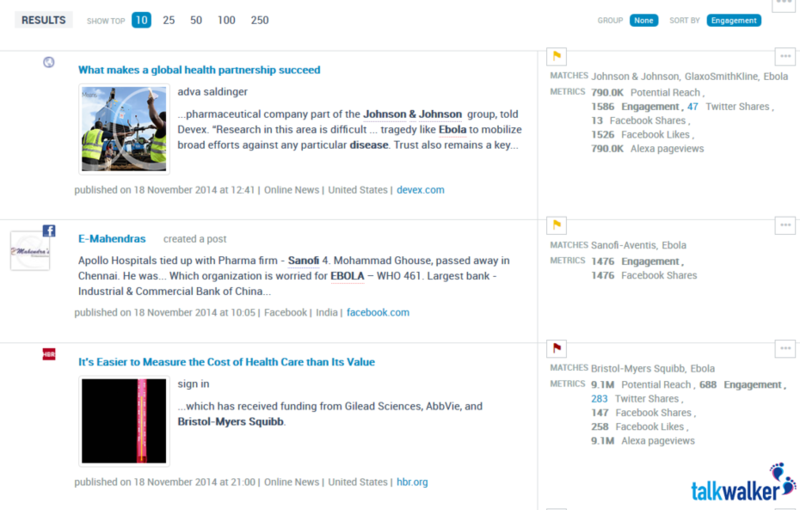 Major players like GSK or Johnson & Johnson, both involved in the development of an Ebola vaccine, can use social listening to see where their efforts place against those of their competitors and gauge public reaction to the progress they are making in the development of new products. At the same time, they can find out which topics dominate the conversation and if there are any particular areas of their research or development that might become relevant in the future. Knowing these facts also allows the companies to draft communication strategies for different situations, for example for crisis communication related to one of their products. The conversation surrounding the Ebola epidemic is full of vital information that pharmaceutical companies can use to aid the research and development of new treatments and vaccines. It even includes insights into infections that appear to be completely unrelated at first glance, but can still heavily impact the life of patients. The benefits of knowing about these conversations are not limited to a single department. From market research to communications departments, to researchers and sales representatives, a number of different teams can benefit from the information gathered by social media listening and analytics. If you want to find out how to set up successful social listening, download our free guide with the 6 essentials to social media monitoring for the pharma industry.